Healing methods in yogic science is based upon inside-out purification, holistically operating upon the mind, body and soul. Asana, physical exercises to attain this purified state and pranayama or breathing exercise to build energy into the body are the two main supplementary techniques in yoga. Without proper cleansing, your body and mind will never be ready to receive maximum benefits from the yogic practices which are meant to propel the soul towards a higher sense of consciousness. As per directions in the Hatha Yoga Pradipika, the body is like a temple. Just as you cannot let dust and mire accumulate at the site of worship, it is profanity not to clean the body of the impurities. There are six main cleansing techniques, also known as shatkriya or shatkarma. Both from the point of view of mental and physical health, performing shatkriya are of utmost importance. This may come across as very unconventional, but in the healing sciences of ancient India, emesis or the act of vomiting has been a major way of wiping the internals of the body off toxins. In yoga and Ayurvedic practices, emesis is encouraged by inserting catalyzing elements in the body. Traditionally, in Dhauti cleanse, the practitioner has to drink two to three glasses of extremely salty water. Inevitably, a vomit will follow, cleansing the digestive track. This has to be repeated with a few hours break in between. Alternatively, yoga masters recommend using a 20 inch piece of cloth, which is to be swallowed, letting it sink into your stomach. After a while, the cloth has to be plugged off, taking out the impurities with it and thus restoring the body its natural balance and vitality. Needless to say, this is a guided method and should not be undertaken by rough handlers. At any 200 hour yoga teacher training course in India, you will surely have wise guidance in carrying this out. Basti is a method similar to dhauti. Only in this case, a pipe is used to reach the bottom of the abdomen and mechanically pull out impurities like undigested food particles and viscous humors. Neti is a comparatively simple process to clean the nasal tract of pathogens and impurities. On a visit to the birth land of India for a 200 hour yoga teacher training in India, you can get a Neti vessel. In this vessel, a nasal pipe is attached for you to inhale lukewarm saline water and exhale it out just immediately. This cleans the sinews and improves the sense of smell over repeated practice. Trataka is a shatkriya to clean the eyes, involving looking at a candle flame without blinking until your eyes are cleansed naturally with tears pouring out. Make sure to integrate meditation in the trataka method. Nauli refers to a special kind of abdominal massage, especially carried out by Ayurvedic experts to push toxins accumulated in the digestive tract towards the excretory valve. 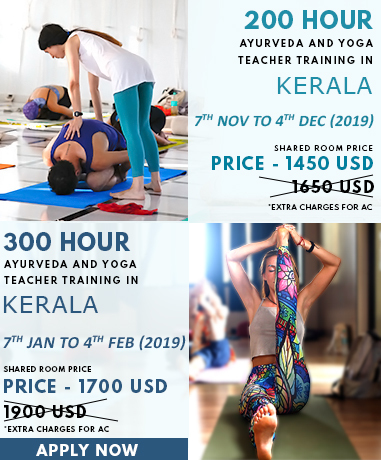 In a 200 hour yoga teacher training in India, you can enjoy nauli massage from the complimentary Ayurveda facilities. This is also known to implore digestive fire with a good kneading to the stomach, liver, spleen, pancreas, and gall bladder. Kapalbhati is a pranayamic exercise of thorough inhalation and forceful, gusty exhalation. This is a great way to focus on the prana or life force through breath and channel it for purifying the body with great oxygenation and boost to the heart. To know about Shatkarma in further detail, explore our Yoga Teacher Training In India.